Are you are a traveller who is going abroad for either a business trip or for sightseeing? Then you need to sit up and pay attention. Planning on travelling abroad usually involves finding the best airline tickets, hotel bookings and places to visit and see. However, you must also give utmost importance to thinking about how to carry money for your trip abroad. There are many options to carry money. You can read this post comparing Forex card, Cash, Traveller’s Cheque, Credit and Debit card. Each option is explained in detail with respect to the cost, convenience, and security in carrying money abroad. Among these, the Prepaid Travel Card or Forex Card is the most convenient and inexpensive way to carry money abroad. So let us look at what is a forex card and how does a forex card work. 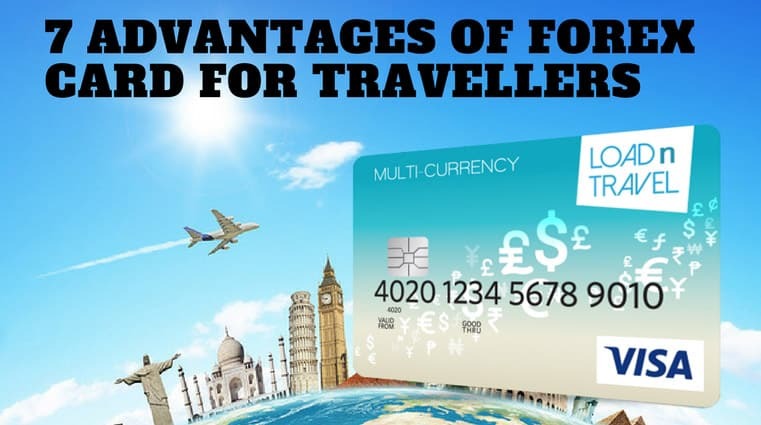 Also, let’s find out the 7 advantages of Forex Card for travellers going abroad. Forex Cards can be either Single-currency Cards or Multi-currency Cards. As the name suggests, a Single-Currency Card can only support a single currency to be loaded and stored in it. A Multi-currency Forex Card supports multiple currencies. Travellers can load and store currencies of different countries in the Forex Card. At the time of purchasing a Prepaid Forex Card from a bank or money changer, the card is loaded with funds. For example, if you are going on a trip to both France and England, then both Euro and GBP (Pound) currency will be loaded into your Multi-currency Card. The Euro/Pound is loaded to the card at the prevailing exchange rate on the day of purchase of the Forex Card. When using the card, there may be a one-time initial activation fee. For shopping abroad, you can simply swipe the card at PoS terminals and money will be deducted from your account. The Forex Card will automatically detect which country you are in and pay using the preloaded local currency of that country. For withdrawing money from ATMs abroad, there may be small flat ATM Withdrawal fee per ATM usage. If the Forex Card needs to be reloaded with funds, that can be easily arranged. The balance money can be reloaded anytime either online or by doing a bank transfer of funds to the Forex Card issuer. Forex Cards offer better exchange rates for loading currencies than buying foreign currency as cash. For banks providing Forex Cards is the cheaper option. Typically, you’ll get a difference of 50 Paise as exchange rate markup for Forex Card compared to Rs 2 markup for buying US Dollar. Forex Cards are loaded with foreign currency at locked-in exchange rates. Thus they are immune to the fluctuation of currency value in the forex market. If you have loaded 1000 USD in your Forex Card, the value in it will be 1000 USD regardless of fluctuations in INR-USD exchange rate. Forex cards are more secure than carrying cash as they come enabled with chip and pin technology for safeguarding the money in them. In case of Forex Card getting lost or Stolen, it can be blocked immediately and the balance in it frozen. The secondary Forex Card issued along with the original can then be activated and funds will be transferred to it. Forex Cards can be used to carry multiple foreign currencies at the same time in a single card. For example, Axis Bank Forex Cards (available through ExTravelMoney) allow you to load upto 16 popular currencies such as Australian Dollars (AUD), Denmark Krone (DKK), Euro (EUR), Hong Kong Dollars (HKD), Japanese Yen (JPY), New Zealand Dollars (NZD), Omani Rial (OMR), Saudi Arabian Riyals (SAR), Singapore Dollars (SGD), Swedish Krona (SEK), Swiss Franc (CHF), Thai Baht (THB), United Arab Emirates Dirhams (AED), United Kingdom Pounds (GBP) and United States Dollars (USD). Forex Cards have no additional charges when swiping at PoS counters abroad, unlike Debit and Credit Cards. Also, Debit and Credit cards when used abroad work at exorbitant exchange rates and would cost you around 5 to 11% extra of the total transaction charge. No Dynamic Currency Conversion Fee. Since Forex Cards are already loaded with the local currency of a foreign country, Dynamic Currency Conversion (DCC) fee will not be applicable when using them abroad. However, this fee will be present in the case of Debit and Credit cards. DCC would add an extra 3 to 5% charge to your transaction cost. 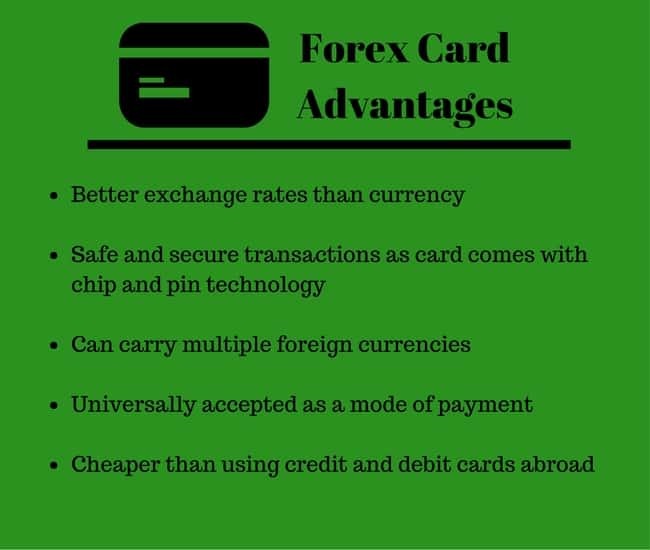 Forex Cards are universally recognized and accepted, unlike Traveller’s Cheque which has become an outdated payment instrument. Also, Forex Cards can be used to withdraw money from an ATM nearby when abroad. However, encashing Traveller’s Cheque is a big hassle as you’d have to find banks or business establishments willing to accept it. Even taxis in some countries abroad accept Forex Card as a payment method. In fact, you can even use Forex Card for online transactions abroad, like ordering items through e-commerce platforms abroad. This is possible since they work on either Visa or MasterCard network just like regular Debit and Credit cards. Forex Cards are cheap and save a lot of money – As stated above Forex Cards are the cheaper option among Cash, Traveller’s Cheque, Credit and Debit cards. The exchange rate offered is the best and this rate is locked-in the card regardless of currency fluctuations in the forex market. Also, since there are no currency conversion and DCC charges while using Forex Cards at PoS counters abroad, this further saves money when travelling abroad. Forex Cards are convenient – Forex cards are extremely convenient and handy for trips abroad. They can store multiple currencies in them which would be useful when visiting more than one country while travelling. Also, Forex Cards are universally accepted and can be used in ATMs abroad or online transactions abroad. Forex Cards are Safe and Secure – Since Forex Card come with embedded chip technology nowadays rather than magnetic strip technology, they are more secure. Just like regular Debit cards, they too need a pin to spend cash using them, enhancing their safety factor. Also, in case of loss or theft of the card, travellers can simply block the card by contacting the card issuer. Then, the replacement secondary card can be enabled which usually comes along with original Forex Card kit. Forex Cards offer better money management – You can manage your money better through Forex Cards as they offer online access to track your spending and transactions through Net Banking. Also, you get monthly statements giving you an idea of how much balance is left on the card. When your trip abroad is over, you can easily encash the leftover foreign currency and thus the balance amount won’t be wasted. 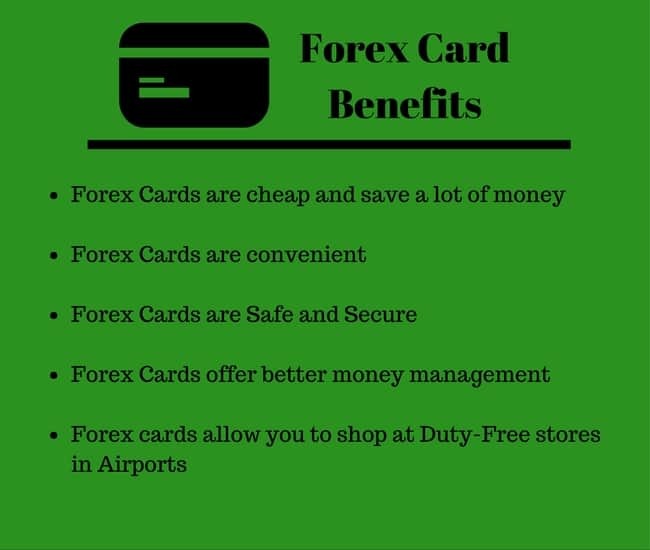 Forex cards allow you to shop at Duty-Free stores in Airports – Once you are coming back to India after your trip abroad, there may be leftover foreign currency in your Forex Card. You can easily encash this or use it to buy items from Duty-Free Store at the Airport. Duty-Free Stores only take payments in foreign currency. Simply swipe your Forex Card there to buy items cheaply for your friends or family. To conclude, if you have plans on travelling abroad, consider how you are going to carry money abroad. Think about buying a Prepaid Forex Card. A Forex Card is one of the most essential items that’ll help you on your trip abroad. You can easily compare and buy Forex Card online from money changers in your town/city through ExTravelMoney.com.